50% off Pecan Pie: Why Not? One of the ways I save a ton of money on groceries is by looking for reduced prices at Wal-Mart. 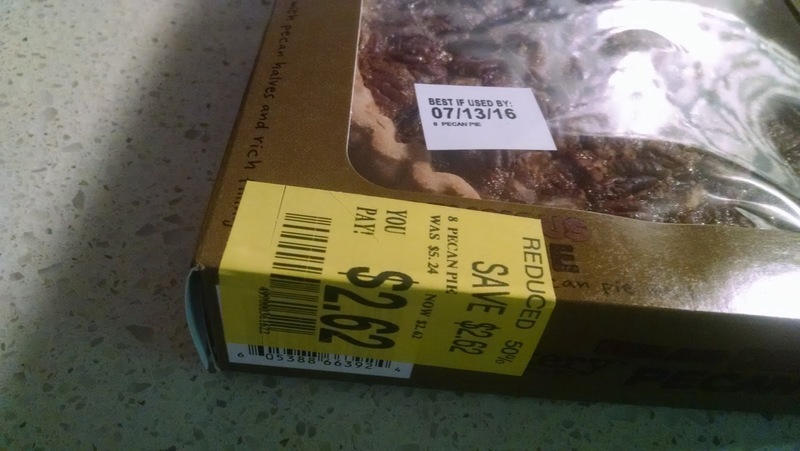 In the grocery department, these discounts are spotted easily by the large yellow stickers. I can almost always find discounted items, but have had more luck visiting mid-day on weekdays. First, the bread rack: my local store hides this in the dairy aisle, far away from the rest of the bread. Most items are marked down 50%. This includes pies, rolls, loaves of specialty bread, and cookies. For some reason, the Cuban bread is 70% off. I get a long loaf for $.30. Cream pies are also marked down 70%. In the meat department, I can always find different types of meat that have been marked down. Meat is only marked down 30%. The advantage here is that I can freeze the items I won't be using right away. Today I purchased ground turkey, sausages, and boneless, skinless chicken thighs. 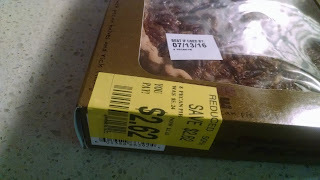 There were several other deals I didn't take advantage of, including steaks, seasoned Angus patties and pork chops. Finally, prepared items are marked down by half. Going just after lunch is a good time to catch these items. Cooked pizzas, rotisserie chickens, chicken wings, and deli sandwiches are regularly marked down 50% if they don't sell fast. Wal-Mart is a great place to find discounted groceries. Another place I go to is Aldi. Aldi typically discounts special items that don't sell by the time the next circular comes out. I've got my eyes on some LED lamps right now that I hope will get discounted. They also discount their bread, refrigerated items like yogurt, and shelf-stable limited time goods, like cake mixes and special potato chips. Occasionally I will find frozen merchandise like pizzas or ice cream at a discount. I never see yellow stickers on meat at WM. Wonder why? I stay from the markdown bread rack because I can usually only find sweets. It is after noon on a Wednesday, so I have to go out and might stop in there. Here, the rotisserie chickens are $2.48 at 8:30 pm. Maybe your store has more predictable sales? I imagine consistency in what a particular store sales would mean fewer markdowns. I live in a snowbird area where the population peaks during the winter, and there are fewer markdowns when everyone is in town. Maybe you shop at a higher volume location that turns its merchandise more quickly. Let me know if you have any luck! I just learned about the rotisserie chickens. In my store they are marked one half after four hours. I dont know what the standard is for other items, but I am never there at the right time. I do find the five dollar chickens a good value. I've gotten into the habit of stopping in if I pass Wal-Mart on my way home. I don't always find a deal but I've had better luck during mid-day than at night or early morning. But you still have to be careful -- the box of marked-down doughnuts I just got there contained 'rocks.' I'll return them this week. Many items are timed to the end of the month...so stopping just before that generally produces some good stuff. Also try late on Sunday nights. Our local King Soopers has great markdowns then. Rocks? That's crazy. The only problem I have had is when I bought bread that turned moldy the next day. Since it was marked down when I bought it I just chalked it up to bad luck. I haven't checked specifically at the end of the month but that makes a lot of sense.